Newborn photos are a MUST HAVE these days. They don't just celebrate the arrival of your baby but they can also commemorate the new addition to the family. A great way to tell your family newborn story is at home. 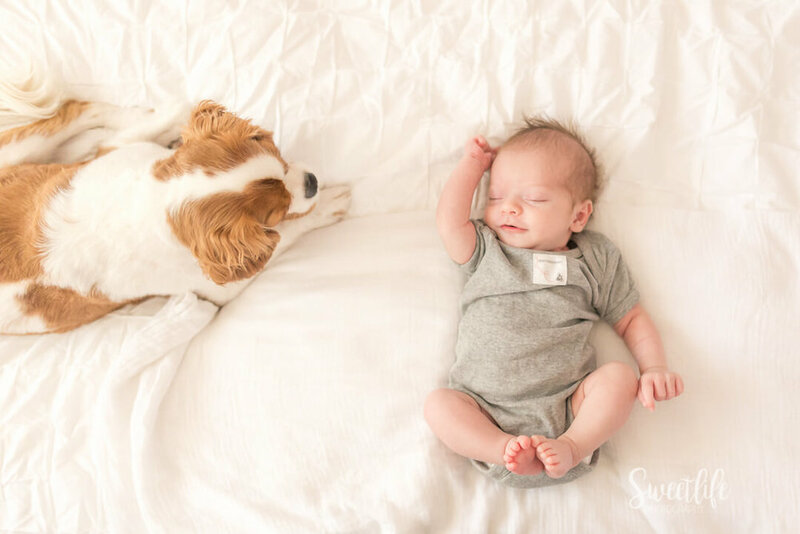 In this blog post, I'm sharing tips on how to know if an in-home lifestyle newborn session is the right session for you. Fresh 48 session are natural, raw, and filled with emotion. They are a peek into those first 24-48 hours of meeting your newborn baby and are simply magical. Sure, the hospital decorating choices might not be the most stylish place for photos and yes, you're going to be (and look) exhausted because you just delivered a baby but these are moments you will never get back but will always cherish. Simply newborn studio sessions are geared toward the mama who wants an entire gallery of just baby (siblings are welcome, too) but doesn’t want to worry about preparing the house, her family or herself for photos (girl, I get it!). This natural, baby led posed session takes place in my North Central Phoenix studio with access to my neutral collection of newborn props. Think a studio session might be more your style? Check out this blog post to be sure! You have lots of natural light in your home. Photographers need light to create an image. The more light, the better! It's incredibly difficult to do that in a home with small windows and dark rooms. I always seek out locations in a home with a large window or sliding glass door and shoot there. I typically seek out the master bedroom, nursery and main living room as these locations tend to have the most access to natural light. You prefer a more relaxed, natural, unposed style that includes the family. Lifestyle (family) sessions are a relaxed, intimate story telling session that provide a peek into life with a new baby, at home. I guide you into natural poses -- sit together on the bed, move in close, look down at your baby. But the vibe is calm, relaxed and casual. I toss in some documentary shots of those sweet in between moments of soothing, breast feeding (if you choose) and diapering because that's REAL life with a baby. Big sis, big bro and of course those furry family members are also included. You're Not looking for the "baby in a bucket" newborn portraits. To be clear, NONE of my newborn sessions are super posed. And I don't love props (aside from the dainty headband and swaddle wrap). I don't ever put baby into a pose that doesn't come natural to them (i.e froggy pose or the infamous baby holding their head in that hands). While cute, those poses just aren't natural for a newborn and I prefer to showcase baby's pureness while creating timeless images that don't require a naked and posed baby. At home, a swaddle is our best friend and used for most of the session. Being wrapped helps baby stay settled and sleepy (yes, even if your baby doesn't seem to like to be swaddled - I've got tricks!). I may capture a few portraits of baby in just a diaper on the bed, or in a neutral onesie in the family shots. You love portraits filled with emotion. Photographs are a moment frozen in time. A moment that you will never get back but can always relive by looking at the images. Newborns are tiny for such a short amount of time and the newness wears off. The expression of tremendous love is truly priceless. You want your pets to be involved in the session. Your fur baby was your first baby. So many families would love to capture their ENTIRE family together, including their beloved pets. 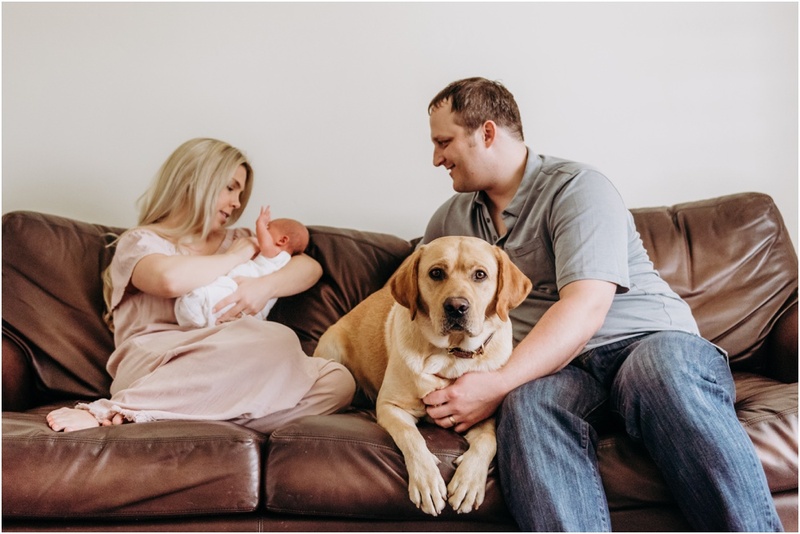 Lifestyle sessions are the perfect way to include your dogs or cats and I'm a HUGE animal lover so I love incorporating them into family shots and special candids of your baby's new best friend/protector. You put a lot of thought and care into decorating the nursery. You'd love to remember it exactly as it is and share it with your baby years from now so they can see their first bedroom. You spent endless hours looking at bedding, mobiles, furniture and decor for your baby's nursery. You spent months pulling everything together, arranging the sentimental gifts, toys and books. You stood back and imagined yourself holding your baby in your arms while rocking in the glider. You walk by their room everyday and are reminded of the tiny new tenant that is about to move in. Does a Lifestyle Newborn session at home feel like the right fit for how you would like to document your newborn? For studio/posed newborn photography it is of the utmost importance to schedule the session before the baby is two weeks old. But a perk to scheduling a lifestyle newborn session is that the age of baby doesn’t really play a key factor. I encourage mom and dad to take their time getting settled back in at home. After all, Mom might need a few extra days for recovery (especially if you are a c-section mommy, like I was…twice) and big brother or sister is still getting used to the idea of the new baby. A lifestyle in-home newborn shoot can be scheduled anytime. Your baby could be 6 weeks old! 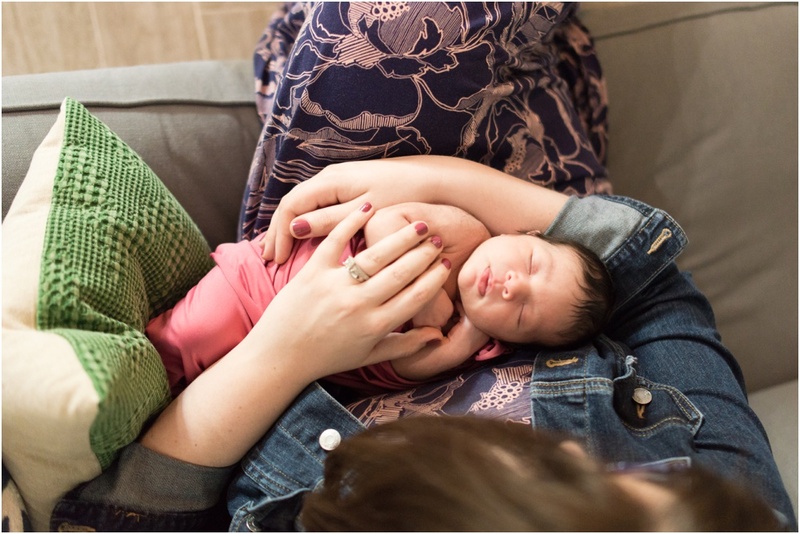 The focus is the interaction and connection between the new baby and the family, his or her new surroundings and is much less centered around obtaining the sleepy baby shots.